Graduated glass cylinder used in determining amount of soil in dispersed suspensions contains 1000ml at 20°C (68°F). Open end is fire-polished without pour-out. Dimensions: 18" (457mm) x 2.5" OD (64mm). Base is 4.333" (110mm). Uses a microprocessor-based temperature control with integral heater and chiller. 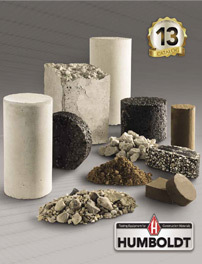 For dispersing soil suspensions used in hydrometer method of testing subgrade soils. Seamless, symmetrical stem and bulb do not vary in diameter. Stirring Paddle for H-4260 Mixer.